A couple weeks ago I wrote a post on partitioning 2 cubes that had different dimensionality. Today I want to talk about how to do some advanced partitioning in Essbase. What do I mean by advanced partitioning? Say you have two cubes…one has dimensions Year, Period, Entity, Product and Measures. The other cube has Time, Entity, View, Calc, Product and Measures. The Time dimension is a combination of Period and Year and the parent members in Entity are not one for one in naming. How do you partition these? Once you have chosen the type of partition you want to do (Transparent is our example), you will want to list the areas of the partition you want to map that are not one for one. In our example, the Period and Year will map to Time, Calc and View. Next, you will highlight the first row and click the “Advanced” tab at the bottom. This is where you will define the specfics of the area mapping. Since none of the members map to each other, you will map the members to “(Void)” (a system generated name…do NOT type this in! It will fail…). 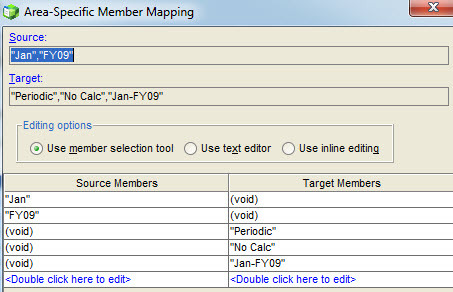 This tells Essbase that each grouping within the Area-Specific Member Mapping “belong” to each other. You will need to do this for each area mapping listing on the Areas tab (yes, this can be tedious if you have many lines!). On the “Mappings” tab is where you will map the Entity parents. These values are the ones that are mapped one for one in each cube. When you validate, you may get warnings about the cell counts not matching. This is fine (unless you are using a replicated partition because you need the exact same cell counts in each cube to replicate the data). And that’s how you do advanced partitioning in Essbase! Previous Post: OT: #Goal412 Update!